The Internet is a fascinating place. It feels good to know that my tiny blog is part of a larger behemoth that is expanding every second and evolving frequently. This year I am celebrating #jamaipanese10 – 10 years of blogging here at Jamaipanese.com. 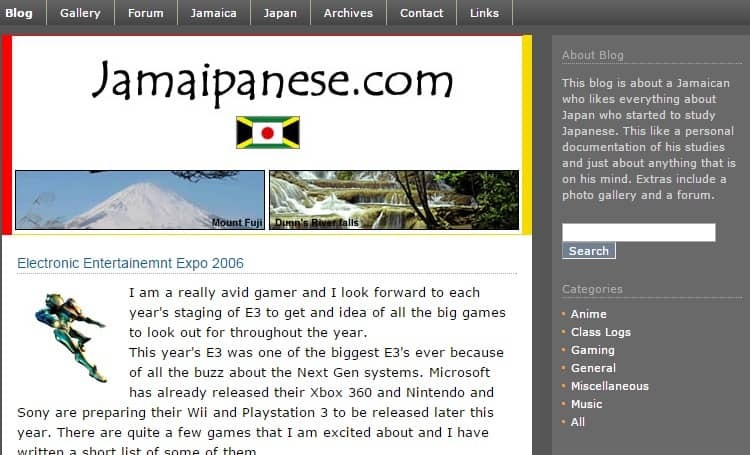 I was curious to see how the design of Jamaipanese.com has changed over the years and surfed into the Internet Archive’s “Wayback Machine“. This website takes snapshots of webpages over the years so that we can look back at them in the future. How cool is that? I hurriedly typed in Jamaipanese.com and unexpectedly boarded an emotional ride through the history of the design and content of my blog. Check out the video above and a few of the screenshots below with links. Check out some of the older designs of your own favourite websites and leave a comment below or tweet me @Jamaipanese on Twitter. Keep in touch for more #jamaipanese10 posts! Excited to learn about Wayback Machine and also see your blog progress from way back when. Amazing how we evolve and keep getting better & better as the years go by :) Can’t wait to look back on my own blog progress too! It’s been slow writing but I push on with my hobby nonetheless as best I can. Cheers.